Unit 35B Lot 46; TOT ID# 1649. This well equipped ocean front home features two bedrooms two baths and a large open living room - kitchen - dining area with great views through out. Take a soak in the hot tub or enjoy the white water ocean views from the deck. 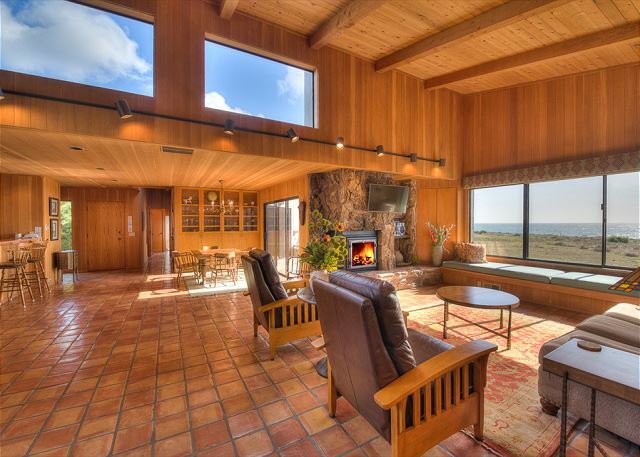 This property is located on the northern end of The Sea Ranch and a short walk to the Sea Ranch Links Golf Course. Due to the close proximity to the ocean bluffs, homeowner suggests guests age 16 and older occupy this home rental. Bed linens and towels are included with this rental. Internet available. 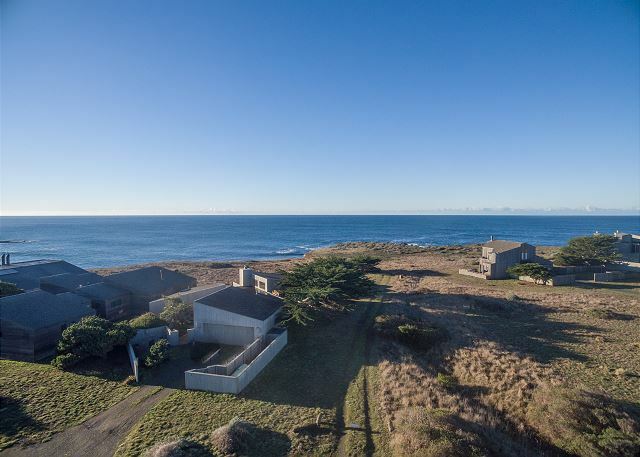 Great view but long walk to beaches since it is on north side of sea ranch Master bedroom and bathroom great second bedroom also has view but second bathroom dark and small. Wonderful! Fabulous views, very clean. Light on amenities but overall very, very good. Great location with ocean views and comfortable space for a family or two couples. Great ocean front rental for 2 or 4! In reading past comments it's quite apparent the owners are continuing to make improvements. New king beds, comfortable furniture. Tho kitchen is dated all appliances are newer and good supply of dishes & cookware. Nice flat screen TV's, good internet,real nice gas fireplace, beautiful new hot tub. Gorgeous views, great location for walking trails. Close to Gualala. A few suggestions to owner: install dimmers on the ceiling & wall lights. Add 2 more chairs to deck. More hangers! (we stayed 9 days so had many clothes). Very comfortable home, would stay again. Thanks. Second time we have stayed at Sea Ranch, the first time at Strack. Nothing between you and the sea but a bit of grassy coastline. The spa and the deck are excellent for gazing at the sea during the day and the stars at night. The master bedroom has a long view down the coast. Great light in the rooms. From picking up the keys to getting the deposit back everything went smoothly. Pro tip: we didn't even try to park in the garage so I'm not positive it's possible but if you can, park inside. The nightly fog deposited a noticeable residue on our car. Dirty windows are a shame when the drive either way on the coast is so beautiful. Strack House a must see. We had a very relaxing vacation. The accommodations were excellent. we would highly recommend Strack House to anyone wanting to be near the ocean and to the shoreline trails. Lovely home with everything you need! Great views of the ocean and easy access to the bluff trails right off of your patio. Comfortable beds and a well-outfitted kitchen. We will be returning to this beautiful and peaceful home in future. The house was spotless and the property management company provided great customer service. To start - to be fair we are quite picky with regards to accommodations. And having a vacation rental of our own we have a decent understanding of what goes into keeping a home clean and comfortable for guests. It was just the two of us on this visit but I can say that the layout of the house is great for two couples. 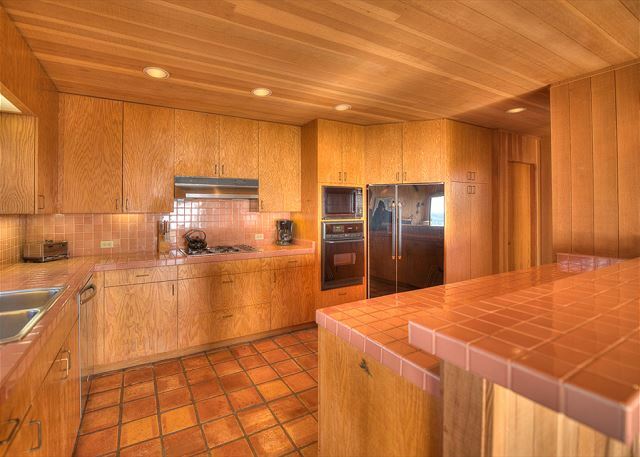 The kitchen is quite large and has pretty much all you need to prepare meals - not the finest of flatware, pots, knives, etc - typical vacation rental kinda stuff. Same with the furniture throughout - not the finest furniture but comfortable enough and functional. Except the bed in the master (didn't try the other bed), but the bed in the master is very nice with incredible white water views down the coast with the beautiful sounds of the waves crashing on the rocks below. Simply amazing - relaxing - tranquil. Bathrooms are large but definitely old school with cramped tiny plastic insert type showers. Didn't try the hot tub on the deck but did check it out and it was super clean - crystal clear water - which is nice. It is great to have a garage to park the car at night - nice bonus there. Great deck to hang out on looking out over the ocean. Lucky it was only two of us staying as there were only two chairs provided and they are designed to have seat pads and no seat pads are provided so they sit a little strange. But you forget any of the problems the house may have just staring out at the ocean - mesmerizing!! Just so you know going in that the house is stocked with very little paper goods, towels, cooking products, etc. Cheap toilet paper, no tissue, no olive oil, some salt, no pepper, some paper towels, no coffee - so bring everything you need to cook with you if you plan on cooking. And we only had four bath towels in the whole house for three nights. Again good it was only the two of us for this visit. Strangely there are a million or so extra bed pillows stocked in the closets. Walk on the bluff, listen to waves, watch birds, perfectly relaxing. Strack house is in a great location for bluff trail access,ocean views and peacefulness. 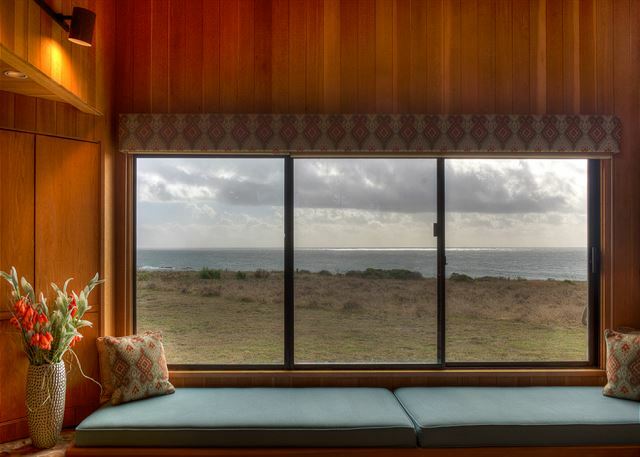 The master bedroom has a beautiful ocean view. Lots of windows in the house make for a bright feeling and offer views from all the living areas. Loved the hot tub! The home was clean and well supplied. Would definitely rent this home again. 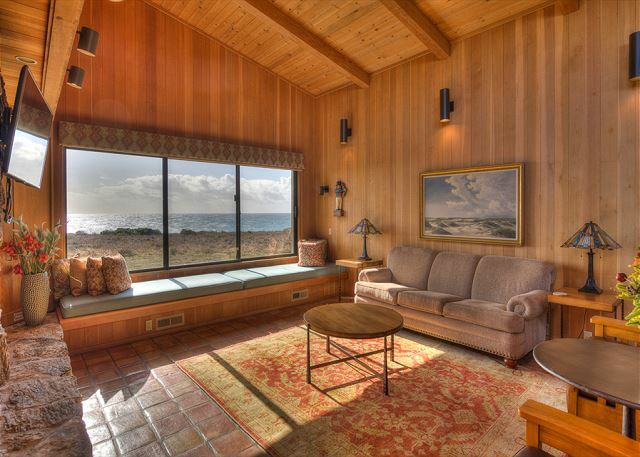 The house is very well appointed, near Gualala, near the coastal trail with beautiful views. This is our favorite house at Sea Ranch. We have rented this house for many, many years over and over again. Recent upgrades make it even more appealing to us. Our first stay at Strack and really enjoyed it. 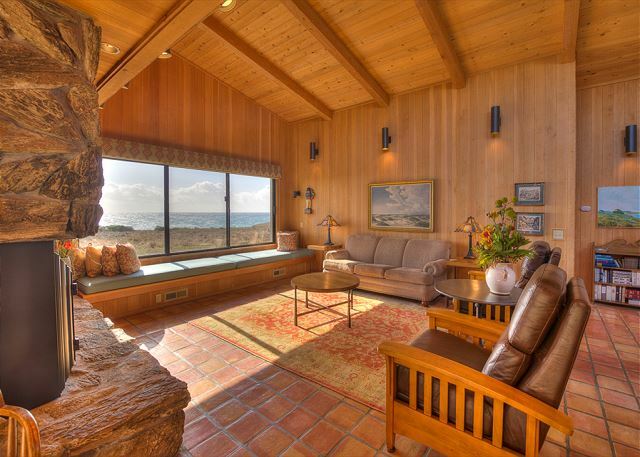 The views of the ocean and surf were spectacular, particularly from the very nice master bedroom. Nice living area. Kitchen dated but not a problem. Well located on end of cul de sac with a lot of privacy. Beautiful ocean view and great house! The house was very clean and well supplied with dishes. The beds were extremely comfortable. The only downside what there was not internet available through WI-FI and the hot tub is shallow, so if more than two people are in it you have to keep your legs bent up to your chest. Great house though! If they switched out the hot tub, this would be the place I would return to! The Strack home is well located on the bluff overlooking the ocean. It is comfortable, well appointed, and pleasant. We had a great time there watching the whales go by at breakfast time, to magnificent sunsets, to a full display of stars at night. It is close to hiking trails and has everything one needs for a pleasant vacation. Delightful location with down coast views. The home has recently undergone some renovation of furnishings, window repairs, new dishwasher and linens. It needs carpet replacement in both bedrooms. We have rented this house many times. It is like a home away from home for us. 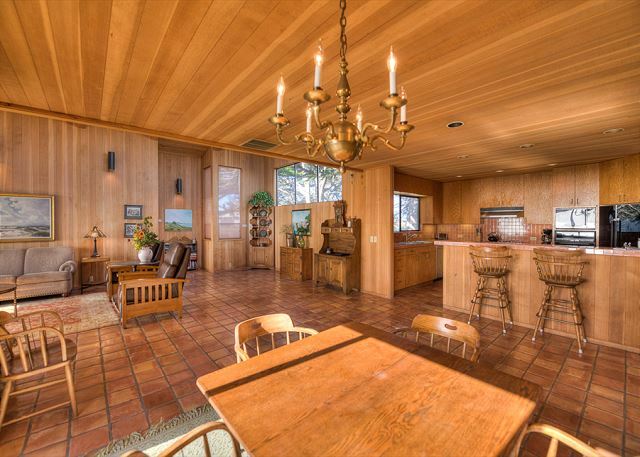 It is conveniently located near the town of Gualala, the golf course and the bluff trail. The house has great views of the ocean and the bluff. It has Wi-fi and the conveniences of home. The only complaint I have is that the wifi went down at about noon and didn't come back until 8 or 9 at night. Other than that, the 2 weeks I spent at Strack house were wonderful. The house is bigger than it looks in the pictures, clean, and the bluff trail is right outside the backdoor. 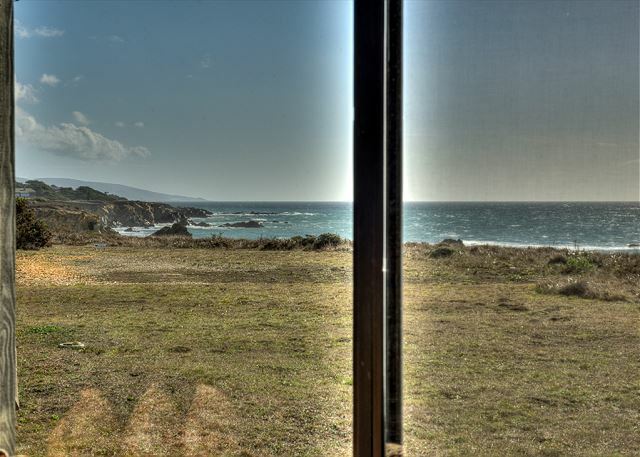 Sea Ranch is the best place to stay! I had family from overseas and we had the best time. The home we stayed at was clean and comfortable. The location had its own beach and great shoreline trails. I will definitely be coming back. Megan & I really enjoyed our stay at the Strack home. Walking in we felt very much at home. The layout and location were excellent! The general condition needs some upgrades but we understand that is in the future plans so I gave it only 4 stars. It was a great week that we spent at the Strack home. We will be back!! We love this house and the location. It is near the bluff with wonderful white water views. It is also near the city of Gualala and the golf links. It truly provides a great escape and relaxing time. We stay here every time we go to Sea Ranch. It's a bargain. The Strack house is great house in a great location. It is clean and well-maintained. It lacks Wi-Fi and the stereo and televisions are old school, small and fuzzy (cable). The furnishings are dated, think the 1970s. The master bedroom has a queen size bed. The second bedroom has twin beds. The white water views are tremendous. The ability to place your car in the garage is a real plus. The property manager provided excellent service. It is conveniently located, particularly for golfers like me. We have rented this house for many years and I would recommend this house to friends who do not need Wi-Fi and who do not spend time watching television. A gas fireplace was recently installed and it was an improvement over the previous wood fireplace. We have rented this property many times. 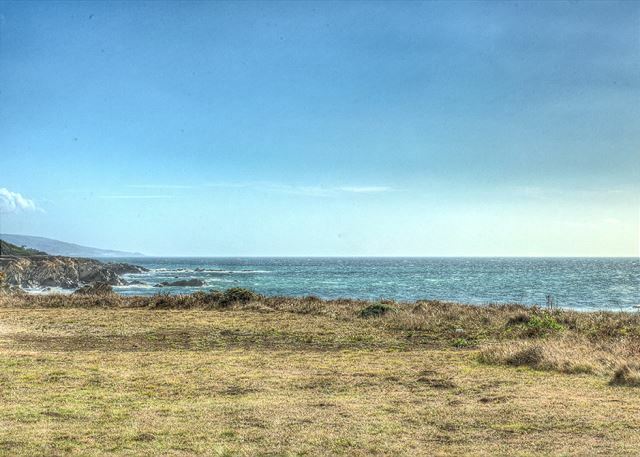 We love the location and the proximity to the town of Gualala. One level home and use of garage make it easy to unload luggage etc. Great ocean view. Very relaxed atmosphere. I stayed in the house. It was a large house for a two bedroom. The hot tub was dated but worked fine. The views are just amazings... coastal splendor! A really nice house, fully furnished and everything worked just fine. The deck was almost completely protected by the wind which was really nice. A very nice trail to walk along. There is a trail down to a beach directly behind the house, but it is a very steep trail. Not recommended, pretty much have to slide down and then pretend you are a rock climber to get back up. No sand anyways, just large rocks. Though there are a couple of very small tide pools. There were some deer and raccoon in the area. But never a problem, the garbage cans outside are in an enclosure. The house and all the windows point slightly south, so you don't actually see the sun set from inside the house or deck(at least in the summer time). But still a great view none the less. Would absolutely stay again. great location; beautiful views; dated furnishings and electonics(but who cares); bring your own 21st century reading materials the historical magazines are good for a laugh but not much else... ;o) Enjoy! We have been at this house many times and always enjoy it. It is relaxing and beautiful. It is also near Gualala and the golf links. This was our second stay in Strack. The location is excellent, and the house is well maintained. This home is in a magnificent location -- 1-2 minutes walk to the ocean bluff path, with beautiful walks in both directions. Lots of blue and white water views and flowers. It is particularly wonderful in late May-early June when the area is a sea of yellow lupine, iris, poppies, and many other wildflowers. The interior of the home is spacious, uncluttered -- with drop-dead views from livingroom and main bedroom. Furniture is old-fashioned, but comfortable. Very quiet and peaceful! Big 2-sink bath and enormous walk-in closet. We love this vacation home. We go there every time we want to be at Sea Ranch. The location is great, right by the cliff trail with a beautiful view of the ocean. It is also near Gualala and the Golf Course. We just love it! Wonderful location right next to ocean, friendly staff, well equiped and very clean unit. Awesome trais and area! This is a great house for us. Convenient location near golf course and Gualala shopping and restaurants. The view is simply great. Also the house is near the bluff trail which allows beautiful walks and viewing of marine life. We have rent this house many times. We will be back again. We enjoyed a week of great weather in a wonderful location. Strack is comfortable as an old shoe, but they need to upgrade the beds and televisions to modern standards; i.e., king size bed and flat screen HD televisions. Incredible location. House is a bit outdated. This is a perfect small house on the bluffs. Reasonably priced, very usable lay out, great light, easy access to Gualala Pt. Park and Sea Ranch Golf Course. Only shortcomings were a hot tub that didn't get hot enough, old, too small TVs and a stereo sytem from the dark ages (cassettes only). The house is really great ...in a perfect spot to look at the sea and to take long walks on the bluff trail. Also it is very near Gualala and shops and restaurants and also a great golf course.